If you look at any user poll or “ranking” of Mega Man games, Mega Man 2 is guaranteed to be at the #1 spot, or pretty darn close. This is within good reason; after all, Mega Man 2 takes a look at the first game and improves on it in almost every way. It even gets rid of the asinine “score” system that was so forgettable, I actually forgot to include it in last week’s retrospective. But is this surely the “best” of the original Mega Man games? After all, there were eight made after this one, four of which were also on the NES, surely there must have been some improvements over time that only made the titles more enjoyable? Or could this just be nostalgia and familiarity of a title that sold over 3.81 million units, making it the highest selling Mega Man game? Upon learning about these robots, Mega Man sets out to destroy them and storm the castle. Upon being defeated, Dr. Wily escapes and reveals an insane last-resort plan (more on that later), but that plan is quickly thwarted and he once again gets on his knees to beg for forgiveness. Mega Man 2 is the entry in the game that cemented in the core path for future games to follow. It was a a team-based, not corporate, decision to make this sequel, and that love is obvious. The first big change is an intro sequence detailing the story for the game. While it’s more simple than the first game’s premise, reading the manual isn’t required for players to understand Mega Man’s motives, which is good, as you’ll be extremely lucky to even find a Mega Man 2 manual today. In the original Mega Man, the player had to beat the entire game without turning off the console. Mega Man 2 fixes this by adding in a password system. This system is used for the remainder of the original series on the NES and is also used in the SNES Mega Man games. This is also the first title to include “E Tanks,” which fully refill Mega Man’s life. The number of robot masters has also changed from 6 to 8, which is something that has been a series staple, present even within the X series. This will also be the first time the Mega Man series features a “Boss Rush” room near the end of the game. In this room, the player will be tasked with fighting all 8 robot masters in any order they choose, ultimately leading to a fight with one of Dr. Wily’s machines. This formula has remained consistent for the majority of the series. Another piece new to the series are three “helper items.” In the first Mega Man, there was the obtainable Magnet Beam, but Mega Man’s three helper items are unlocked by defeating specific robot masters. These abilities are primarily for helping traverse obstacles such as one that creates rising platforms, one that creates a jet, and one that creates a platform that climbs walls.This third item is hardly useful, but it set a trend for the rest of the series. There will always be an item that assists in movement upward, an item that assists in movement horizontally, and an oddball item. These items will soon become a faithful companion, but we’ll talk about that good boy another day. Mega Man 2 feels like everything the first Mega Man should have been. It doesn’t add any overhauling gameplay mechanics, but perfects what has already been established. Each stage feels distinct from the other, with a defining hazard such as Quick Man’s lasers or Heat Man’s disappearing blocks over a lava flow of death. If anything, Mega Man 2 feels like, in its own way, the first real Mega Man game. Every title from here on out will base its core gameplay around Mega Man 2, with their own quirks added. This game isn’t without its faults of course. Far too often, there are moments where the player is killed blindly. For instance, in Dr. Wily Stage 4, there is a part of the stage where you can fall through the floor. The game is sure to teach you this before any real dangers are placed in your way, but it isn’t an obstacle you can actually pinpoint until you hit it. You’re never taught a way to overcome it other than don’t risk it. So when there is a pit of spikes below a platform, it’s not obvious where the fake floor is, resulting in a game of trial-and-error. Speaking of Dr. Wily Stage 4, it has one of the most frustrating bosses in the series. Instead of being a traditional fight, the you are faced with a room full of turrets that can only be destroyed using the Crash Bomb. To make matters worse, there are breakable walls and no room for error. If you use any of your crash bombs incorrectly, you have to die. But dying doesn’t just place you before the boss room. You’re sent to the mid-point of the stage, before a long series of moving platforms without a good spot to earn weapon energy. Fortunately, the bombable walls stay destroyed. In these retrospectives, I’m taking a look at the following qualities in a Robot Master: boss design, level layout, and special weapons. For anyone starting Mega Man 2, or the franchise in general, Metal Man is absolutely the way to go. The stage layout is essentially full of enemies that can be telegraphed, save for a brief moment with enemies that drill through the floor, and it’s overall friendly for players getting into things. Personally, I’m a fan of the background aesthetic as well, as the gears constantly spinning give life to the stage. Metal Man himself can be seen as a pushover, but that’s only because of how easy it is to telegraph his moves. He throws three blades towards Mega Man, which can be dodged with enough pre-planning. To amp up the difficulty, Metal Man’s boss arena makes use of the conveyor belt introduced earlier in the stage. He not only uses the gear aesthetic throughout his attacks, but his boss battle encompasses a big element of what the player learned on their way to the battle. This is all without talking about Metal Man’s special weapon, the Metal Blade. This weapon is essential for making it through the game without a serious difficulty spike. Instead of being a normal saw blade that shoots in one direction, the player can actually throw it in any direction they’d like to, making it the first Mega Man weapon to allow this feature. This is especially helpful for an awful vertical segment in Crash Man’s stage. The most common joke for the Robot Masters of Mega Man 2 is how weak Bubble Man is. But his overall presentation isn’t nearly as bad as implied. After all, his stage was the first in the series to feature different physics for water sections. Crash Man, however, has plenty of issues. First of all, Crash Man’s stage involves an extreme amount of waiting, mostly in the form of platforms moving on a track. These platforms, while relatively harmless, move at a snail’s pace around a track. As you ride these platforms, enemies slowly creep in from the sides to knock you off. When you fall off, you don’t die, but you are forced to wait for the platform to finish its track and make it back to you. This process is tedious and can be skipped completely with Item-1. Later on, the stage becomes another ladder-climbing stage reminiscent of Elec Man’s stage from the first game. This time, instead of one ladder straight up, there are several ladders leading towards different paths. Figuring out which path to take the first time you’re playing is purely luck, as you will likely come across a dead end, or an E tank and a dead end, forcing you to back track if you don’t, once again, have Item-1. Add this with enemies coming in from the sides to knock you off the ladder and you have yet another frustrating vertical scrolling segment. Crash Man himself isn’t terrible, however. He’s either incredibly difficult, or a pushover. If you stand to the side at the beginning of the fight, he runs back and forth for a bit, which is more silly than anything else. However, the second you attack, he jumps into the air and drops a crash bomb. Without the Air Shooter (which you can obtain from Air Man), he’s a pain, as he’ll jump out of the way everything you hit the attack button. However, when you have the Air Shooter equipped, he jumps into air, right in harm’s way, dying in just a few hits even on difficult. Dr. Wily is a… what? After Dr. Wily is defeated just after the Boss Rush, the floor breaks and Mega Man is sent to the caverns below the laboratory. This instance is incredibly rare even for later Mega Man games. However, the game doesn’t end at Wily’s machine. There is one more boss fight. As you make your way through the cavern, avoiding dangerous lava drips, you come face-to-face with Dr. Wily himself yet again. He leaps into the air and gives everyone a shocking revelation. Dr. Albert Wily is actually an alien. He displays his interstellar power by shooting pellets in one direction and moving in a set path. This showdown is a 1 on 1 fight, and there is only one phase, and it’s easy. But, if Dr. Wily is an alien, why isn’t that a plot point in later games? After all, there are 8 (soon to be 9) games after this one. That answer is given fairly quickly, as defeating Alien Wily reveals that this fight was just a projection and the real Wily was controlling the Alien with the lights out. But, why is this a big deal? 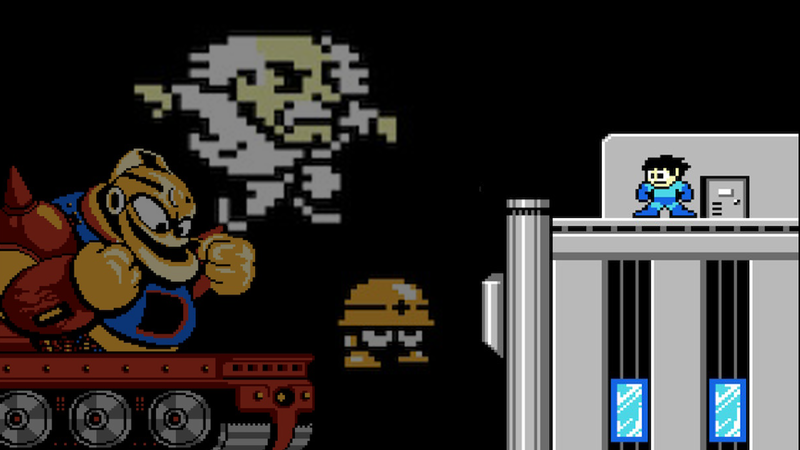 We all knew that Dr. Wily wasn’t actually an alien, right? Well, that’s where we have to factor in the state of the series in 1988. At this point, there has only been one Mega Man game prior, which means lore and backstory were sparse. We were only just learning about the world of this series, and a reveal that Dr. Wily was an alien was completely plausible. This made it one of the most interesting twists of the NES era, as well as one of the best fake-outs in platforming history. Furthermore, it cemented in the character of Dr. Wily that he really is just a crazy convoluted scientist. Mega Man 2 can be widely regarded as the first true-to-form Mega Man game. The first game feels like an alpha compared to this one, and it set the series on a course that spans decades. Of course, this entry has its flaws, but it’s the best possible entry point for anyone in the series. There is a reason Mega Man 2 is the most-sold title in the series. If there was one word to describe this entry, it’s “confident”. However, Mega Man still hasn’t powered up to his potential yet. There are still a few more iconic moves that we have yet to see and won’t see for a few more games. Next week, we will be sliding into something a little different, Mega Man 3.